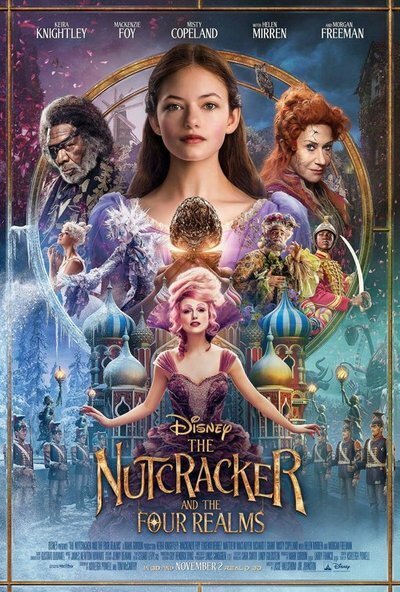 “The Nutcracker and the Four Realms” is a weirdly hideous hodgepodge of images and ideas, as convoluted as its confusing title would suggest. It’s at once familiar and bizarre, overstuffed yet half-baked. And while it boasts impressive individual elements, the overall result remains far from the magic it seeks. Disney’s take on the holiday classic is kinda the story you know, and it’s kinda Tim Burton’s “Alice in Wonderland,” which is not exactly a recommendation. It’s got pieces of Tchaikovsky’s music and some ballet, courtesy of superstars Misty Copeland and Sergei Polunin, but not nearly enough. (Come to think of it, 99 minutes of these powerhouse dancers merely rehearsing their performance would have been more than satisfying compared to this misguided extravaganza.) And while the film’s mythology is dense, it’s also extremely dull. In an unusual move, this “Nutcracker” is credited to two veteran directors, Lasse Hallstrom and Joe Johnston—although they didn’t work on the film at the same time. Hallstrom (“The Cider House Rules,” “What’s Eating Gilbert Grape?”) was the original director, but then Johnston (“Jumanji,” “Captain America: The First Avenger”) was brought in to helm significant reshoots with extensive visual effects when Hallstrom had a scheduling conflict. Maybe that’s why the film feels so unfocused, so herky-jerky tonally. It’s easy to speculate from the outside. What’s clear, though, is that there is simultaneously too much going on here in the script from first-time Ashleigh Powell, and yet not enough. Allow me to try to explain. Mackenzie Foy stars as Clara, a girl who’s understandably struggling to enjoy Christmas following the death of her beloved mother. (Foy, who played offspring Renesmee Cullen in the “Twilight” finale and a young Jessica Chastain in “Interstellar,” has an engaging presence, but her British accent is iffy.) Nevertheless, she must trudge to the elaborate holiday soiree she attends annually with her father (Matthew Macfadyen) and her siblings (Ellie Bamber and Tom Sweet) at the palatial home of her godfather, Drosselmeyer (Morgan Freeman). Before her passing, Claire's mother arranged an extra-special Christmas gift for her this year: an ornate, egg-shaped box, which she can only open using a key that awaits her in a magical, parallel world. Anyway, turns out that Clara’s mom was the queen of the Four Realms, and Clara, as the princess, must stay and restore the place to its former peace and harmony. Because it wouldn’t be a Disney movie without a deceased parent and/or a princess, or at least some sort of princess merchandise to sell. Having said that, the gorgeous and ornate dresses from veteran costume designer Jenny Beavan, a two-time Oscar winner and 10-time nominee (“Mad Max: Fury Road,” “A Room With a View”), are among the film’s few highlights. Clara gets some guidance from the head of the flower realm (a flamboyant Eugenio Derbez) and the ruler of the snowflake realm (Richard E. Grant, covered in icicles). But her new BFF is Sugar Plum, the perky leader of the Land of Sweets, played by a nearly unrecognizable Keira Knightley. “The Nutcracker” gives Knightley a rare chance to ham it up for broad, comic effect under tiers of sparkly purple and a pink cotton candy swoop of a bouffant. Her voice is a perky, girlish wisp as she makes a variety of naughty double entendres, and it’s entertaining as a marked departure for this celebrated actress. But her character and Mirren’s suffer the most from how truncated the script for “The Nutcraker” feels. A major twist occurs out of nowhere about halfway through, which prompted my nine-year-old son to turn to me during the screening and ask: “Who knew?” Not me. The film does indeed make an abrupt tonal shift from which it never recovers, one that strangely turns this magical fairy tale into an indictment of war. ‘Cause kids love that at Christmas. “The Nutcracker and the Four Realms” is an enormous and expensive lump of coal.